Wraped in the exquisiteness of Vindhya and Satpura range, the glorious Amarkantak is one of the most famous pilgrim hubs in the state of Madhya Pradesh. This heavenly destination is well-known as the origin of two great and renowned rivers, the Narmada and the Sone that unleash several stories about the history of Amarkantak. Located at a height of 1065 meters in the central Indian region, this legendary town is of great importance and is known as Theertharaja meaning the King of pilgrim sites. 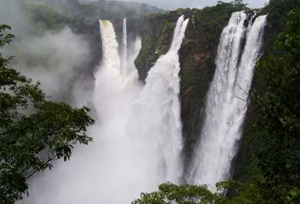 It also holds a very important place in the success of Madhya Pradesh Tourism. Amarkantak in Sanskrit means the 'eternal source,' which is significantly linked with the sacred river Narmada, one of the most sacred and unique rivers of India. This place is visited by a large number of people every year including religious as well as nature-loving tourists, who loves to explore the uniqueness of the place. Some people believe that the famous Sanskrit poet Kalidas named the place 'Amrakoot', as there are a lot of mango (amra) trees in the town and so the place became 'Amarkoot'. History Amarkantak is a land of several stories and it has witnessed several empires, starting from the Pandavas to foreign rulers to the modern times. There are plenty of temples in Amarkantak that describes the era of different rulers. According to one story rumoured here, when Lord Shiva destroyed Tripura by fire, the ashes fell on Amarkantak, which turned into thousands of shivalingas (symbols of shiva). One such symbol can be seen in Jwaleshwar. Since, then it is believed that whoever dies at this destination is given a place in heaven. Beauty of Amarkantak This beautiful place is dipped in absolute serenity with the verdant hills, surrounding the entire town, decent climate, charming natural beauty, and bewitching waterfalls. One can experience immaculate nature in its full bloom in Amarkantak if visited in the winter season. The place is all set to entertain its visitors with holy ponds, sparkling streams, and dense forests that are a part of this amazing destination. Some of the prime attractions in Amarkantak are Narmadakund and Ancient Temples of Kalachuri Period. There are as many as 16 small temples within the temple complex of Narmadakund, which is situated in the heart of the town. Your holidays in Amarkantak can be really memorable if you visit all these places and spend a good time in the religious surroundings of the town. Here are some important details that you may require to explore the exquisiteness of Amatkantak. 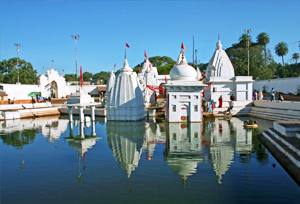 Festivals in Amarkantak The city celebrates 'Narmada Jayanti' every year during January around Makar Sankranti, when the whole Narmada Complex is decorated with flowers and lights and a grand arti take place in evening on the bank of Narmada River. Pilgrims in large number gather at this spot to celebrate the day with great festivities. Other than this, the town also celebrate Deepawali and holi with great ferver and zeal. Shopping in Amarkantak Amarkantak is not a great place for shopping; however, if one has to really buy something, then they can get souvenirs, handicrafts, etc from the temple complex here. Also, there are a few shops that sell herbal medicines and beauty care products for the rejuvenation of tourists. Rare plant saplings can be bought from here to grow in your home compound. By Air: Jabalpur Airport is the nearest airport to Amarkantak, which is located approximately 254 km away from the Amarkantak town. Thera are regular flights that connectes Jabalpur to Delhi and Mumbai. One can take a direct taxi or cab from the airport to reach their desired destination in Amarkantak. By Rail: Pendra road is the nearest railhead that connects amarkantak to other parts of the country. It is approximately 17 km from this holy town and be reached via taxis or buses. By Road: One can take State buses to Amarkantak from Pendra Road, shahdol, and Bilaspur. It is also connected to Jabalpur and Rewa through buses. Best Time to Visit: The best time to visit Amarkantak is during winter as the climate is pleasant and surroundings appear more beautiful during this time of the year. Also, the biggest festival of the city 'Naramada Jayanti' is celebrated during January at the time of Makar Sankranti.